Rarely is an era captured in a single frame. 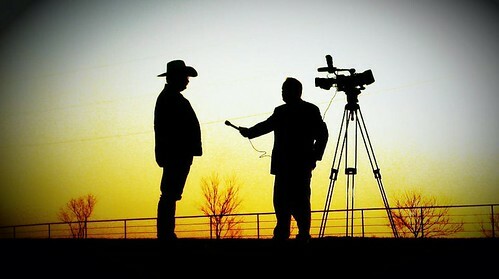 But that's exactly what TV News photog Jake VanDonge managed to do the other night in Clay County, Texas. That he did it with a Droid X is equally astounding, but I didn't log in to yap about apps. No, I'm here for the silhouettes. The one on the left is Sheriff Kenny Lemons, an elected position which more than explains the hat. The guy on the right? Why, that's none other than Paul Harrop: multimedia journalist, ham radio jock and tireless promoter of this very blog. Seriously, besides my Mom (and perhaps Joel Leonard), nobody's turned more people on to Viewfinder BLUES than this broadcast dynamo way down in the Lone Star State. Too bad he's about to bail. 'I'll trade live trucks for Cessnas and shallow graves for tarmacs. 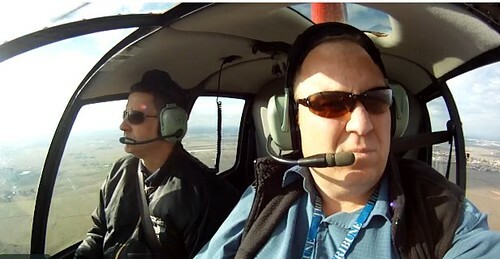 I will miss local news, but I am a storyteller at heart and have aviation in my blood. My father, grandfather and uncle were all pilots. This is a dream job and will hopefully keep me from standing at the side of an icy freeway for endless live shots on it being an icy freeway." Good luck with that, Paul. Should your General Aviation association develop a need for an overly wordy camera nerd, lemme know and and I'll head straight toward Capital City. Better yet, just tell your new friends about my blog and I promise to keep the hell off the Beltway. But before you shake all that Texas dust from your loafers, know this: you've helped me more than you know and a copy of that righteous photo up there will forever hang in a place of honor here in the uppermost reaches of The Lenslinger Institute. Or at least until the wife makes me straighten up the playroom. Ever get caught between the glass and good intentions? Ever get suckered into shooting something destined for the dustbin? Ever held a stranger's ego hostage while warning lights flashed in the corner of your mind's eye? 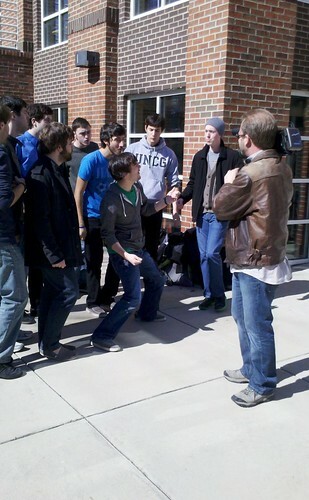 Every get roped into recording a college A cappella group's six best minutes as your own lunch break melted in the midday sun? Ever get the funny feeling what you're capturing with your camera will never see the inside of a TV screen? Ever feel bad when, despite your best efforts, said medley gets erased before a single show stacker feigns the least bit of interest? Ever hear Bohemian Rhapsody sung in eleven part harmony by a group of dudes whose only memory of the song comes from their parents' VHS copy of 'Wayne's World'? Ever pin down the exact moment falsetto, show-tunes and free range scatting became the kind of thing a full grown boy would want to be seen taking part in? Every wonder when you got so damn old? When last we saw Adam Krolfifer, he'd just been sprung from a trunk on the outskirts of Las Vegas. I was there and I can tell you, it didn't smell very pretty. Since then, however, the Lenslinger Institute's first night class graduate has cleaned himself up, married his sweetheart and furthered his studies afield. He's even taken flight. Truth is, we don't hear from him very much anymore. Adam's just shadowy like that; he cloaks his vast gadget acumen behind a slovenly facade. But every once in a while, a shadowy dispatch will reach El Ocho, letting us all know our favorite man-child is somewhere out there, zooming in on his quarry and quite possibly knocking something over in the process. Now it seems the whole world will learn of his cleaning bill exploits, thanks to an exciting new reality series, Krolfifer One, in which Adam and his band of lighthearted mercenaries make California's airwaves safe for bent sheet metal, pointless remotes and the occasional misplaced media format. Okay, so Adam didn't score a reality gig, but a Vimeo clip he recently shared packed more entertainment value than anything I've ever seen on TruTV. Yeah, the plot's a little thin but the visuals are spectacular and the action is taut as Adam and company hover over the Golden State in the name of news. What they're covering I'm not exactly sure, but the mission is clear: shoot some aerial footage, then deliver it to a gaggle of live trucks on the side of the road. They couldn't have picked a better guy for the job, for Adam is versed in video and flight and I'm not just saying that because he used to sleep in a car with personalized plates that read 'Newshawk'. That was back when he was but a plebe at El Ocho. These days, he's a fully accredited lenslinger, one who's youthful exuberance hasn't been beaten down by a flurry of deadlines. Proof? Not only does Adam get the footage where it needs to go, he shoots the whole damn thing on his GoPro, often holding the tiny camera outside what looks to bean even tinier helicopter. Either way, I'm setting my DVR and selling my remote control. Video shoot in helicopter. from Department98 productions on Vimeo.